MARION Integrated Marketing, a B-to-B, Houston catalog design firm, is winner of International Gallery’s Gold Award, the highest honor, for design and production of Total Safety’s 2009-2010 Products and Services Catalog. Total Safety is a leading global provider of integrated safety solutions and services. MARION provided a turnkey service to produce this nearly 200-page full-color catalog that showcases a selection of the safety products, equipment and safety services that Total Safety offers. 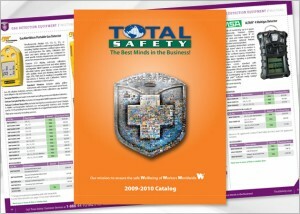 To view a sample of Total Safety’s 2009-2010 Products and Services Catalog, visit our catalog design portfolio. For more information on MARION Integrated Marketing, visit our website. MARION was responsible for the overall project coordination, as well as the content development including writing, editing, gathering product images, proofing and communicating with suppliers on behalf of Total Safety. MARION’s graphic design services included the development the page template and cover design to reflect Total Safety’s graphic standards and brand identity. MARION Integrated Marketing produced the page layouts and electronic production of the catalog. To complete the project, MARION also handled the printing of the catalog. Paul Tyree, Total Safety Vice President U.S. Operations, thinks that “while the catalog is very in-depth with an extensive listing of products, the catalog is easy to read, which makes ordering very simple” for their customers. The catalog was printed on a web press to the final specifications of: 8.375” W X 10.875” H; 198 pages + cover. The cover was printed on 100# gloss paper, and the text was 70# gloss paper. The book was perfect bound with a UV coating on the cover. To learn more about MARION Marketing’s Catalog Design Services, contact us.